Pioneers in the industry, we offer silver micro bangles, silver cz bangles, silver stone bangles, ladies silver bangles and bangles from India. 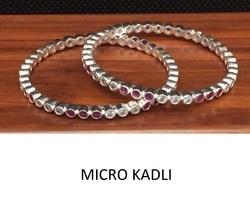 Matching up with the ever increasing requirements of the customers, our company is engaged in providing Silver Micro Bangles. 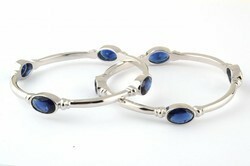 We are a leading organization for providing superior grade of Ladies Silver Bangle to our renowned clients. 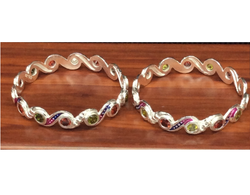 We provide this bangle in numerous colors, sizes and finishes to meet varied needs of clients. We are the prominent organization for providing top class Stone Bangle to our valuable client. Further, we provide this bangle in different colors, shades and sizes in accordance with the stipulations provided by the clients. Our offered bangle is highly cherished and demanded for wedding, gift, general purpose, etc. We offer this bangle in world class packing option to meet the exact requirements of the clients. Silver, a true reflector..silver jewelry manufacturer in Rajkot..Distributor in all over India, designer silver jewelry manufacturer. Silver Jewelry, Silver OrnamentsPayal .antique Payal , ball Payal , bridal Payal , pandal Payal , hallmark Payal , 92.5 Sterling silver Payal , Rajwadi Payal , Dullhen Payal , light weight Payal , heavy Payal , jhalar payal , gola Payal payajani all kind Payal and anklet supplier , manufacturer of India , distributer in Delhi, Punjab , Haryana , Gujarat , Up , Mp , Rajasthan , Orrisa , Bihar. D.S.A.-A SYMBOL OF QUALITY. ROYAL TASTE OF SILVER JEWELRY. Its Shiny, its smooth, its solid...its Silver! Silver, a true reflector..silver jewelry manufacturer in Rajkot..Distributor in all over India, designer silver jewelry manufacturer.An exclusive collection of silver Bangles designed beautifully with the help of gemstones and colours. A reflection of your persona, jewellery featured with pious beauty, elegance and shimmer.